We were lucky enough to explore Bilpin and the surrounding areas and stay at the beautiful Bilpin Country Lodge – farmstay and B&B for a family weekend getaway. It’s only a 90-minute journey from Sydney to Bilpin through spectacular mountain scenery with great walls of sandstone and endless fields. We made a couple of bathroom and food stops but it was still very manageable with our family of four small children aged 2, 5, 6 and 10 years. Bilpin Country Lodge felt like arriving at a relative’s home. We were welcomed on arrival by Kath and her Daughter Nat as well as Toby the Lodge Dog. Kath showed us around the lodge before leaving the property to allow us to unpack and settle in on our own. The lodge is beautiful, clean and well equipped. There’s lots of space for the kids to run around, there’s a games room, canoeing, hiking and so much more. They kids just didn’t know where to look or go first. We quickly unpacked the car and settled into our room – or rooms, I should say. We had Room 3, two adjoining rooms each with their own bathroom consisting of shower, basin and toilet. Beds included two double beds, bunks and a single bed. Plenty of room for our large family of six. The rooms had heated towel rails and reverse cycle air conditioning to keep you cool in summer and warm in winter. It really felt like home. You can book the entire lodge for an extended family get together or catching up with a few families or just a room or two. 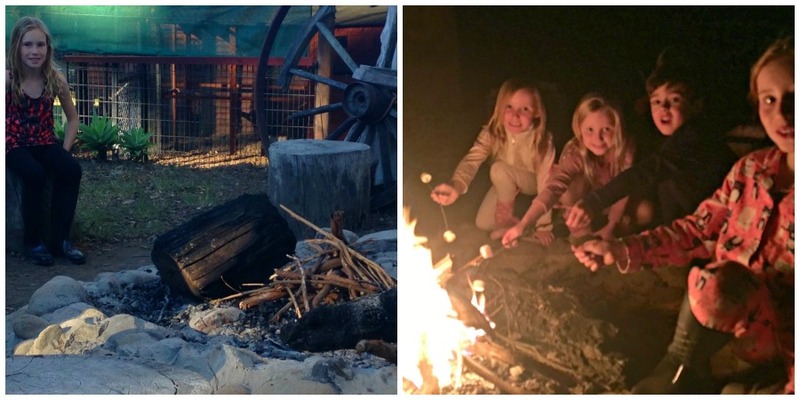 There were three other families staying at the Lodge with us which was great as our kids had instant friends to play with and my husband and I had someone else to enjoy the great local produce and a glass of wine with by the open fire. The Lodge is quite big so there is plenty of room for everyone without feeling like you’re getting on top of one another. There is a formal lounge with an open fire; an informal lounge with a TV and piano; an informal lounge with small TV and pool table; large family kitchen with every appliance imaginable; Games shed consisting of trampoline, table tennis and basketball hoop; large wrap around balcony with three 6-seater tables and chairs and a large spa/pool. The kids couldn’t wait to get outside and explore the property and meet the animals. Michael, the owner showed us the animals and talked the kids through their feeding routine. We met and fed the chooks first. Then fed Charlie the pony and the alpaca. We even gave the neighbour’s horse a feed and a little pat. We then meandered down towards the pond to see the canoes and around to the yabbie pond and lifted the net to find 2 yabbies. The kids were so excited. We continued walking down towards the back of the 10 acre property along the walking track through the spectacular large old trees. Breakfast is provided at the lodge. A magnificent arrangement of bacon, fresh farm eggs, sausages and bread was found in the fridge labeled with our room number. There were also jugs of orange juice and milk as well as breakfast cereals and spreads for our toast. There are loads of local cafes and restaurants to choose from for lunch and dinner or you can bring your own food to prepare yourself in the fully-stocked kitchen at the Lodge. We ate dinner at the local Archibald Hotel the first night - about a 10-15 minute drive from the lodge. Family-friendly pub and restaurant with glorious mountain views which were unfortunately let down by the food. We made sandwiches at the Lodge for lunch which was much easier for the kids and bought some amazing produce from the local butcher and deli at Kurrajong for dinner on the second night. The lodge is so homely and there’s so much for the kids to do there, I’d recommend bringing your own food to eat at the lodge. Don’t forget to buy some marshmallows to toast in the campfire after dinner. The girls loved this – even though we were slightly nervous with our brave fire-loving 2-year old. There’s so much for the kids to do at the Lodge that they were really happy spending time there and didn’t ask for the iPad once! They went in the canoes and tried to catch some yabbies. They were constantly going down to the Chook House to chase and feed the chickens and the lorikeets that would perch above the Chook House. They tried to overfeed the pony and alpaca as well. They played in the playground that’s on the grounds just in front of the lodge. The facilities were all safe enough for my husband and I to sit on the lodge balcony and watch the kids. Even the large outdoor spa had a big pool fence around it so we didn’t have to worry about our 2-year old falling in. The kids loved the freedom to be able to safely explore the lodge and surrounds. The girls begged us to go for a horse ride so we took them for a trail ride at View Valley Park. Located at the foothills of the Blue Mountains, Valley View Park is situated on a large country property three kilometres from North Richmond (about 20-minute drive from Bilpin). It was the first time the girls had to ride a horse holding and controlling the reins themselves, so once they got over the initial fear, they embraced the 1-hour long ride and loved every minute. We had to take the girls apple-picking as that is what Bilpin is famous for. Just a 2-minute walk down the road from the lodge is Bilpin Springs Orchard where you can pick your own fruit. They grow a range of fruit there however only apples (Pink Lady and Granny Smith) were available for picking when we were there. We all headed into the Orchard with our baskets and the girls excitedly filled them up to the top. The harvest season is generally from late January to June. Pack light – All linen, towels, blankets, kitchen utensils, appliances and crockery are provided. Don’t take iPads or DVDs for kids – they won’t need them! Find out more and see why our family loved Bilpin Country Lodge so much by visiting the Bilpin Country website.